Have you followed a ‘diet programme’ where you lost weight and regained it plus more? Do you know someone else who has? If you or your friends want to stop that cycle – then this email’s for you! Over the years my weight would go up and down by about 1 stone and I put myself on a diet when I was a teenager. Now over the last recent years I’ve maintained things at a stable level and have become more and more fascinated with understanding how to feel good about how we eat and our ability to keep healthy body fat and body muscle for us – that is not about deprivation or food restriction. We desire to be consistent with our eating habits and it’s hard to be consistent if we are dieting, breaking the diet and regaining the weight – right? So I’m going to address now…the number 1 reason : Why diets are so easy to break and what you can do about it…. [Now when I say ‘diet’ – I mean a diet programme for weight loss that is based on restriction of calories, low fat, zero carb etc…. 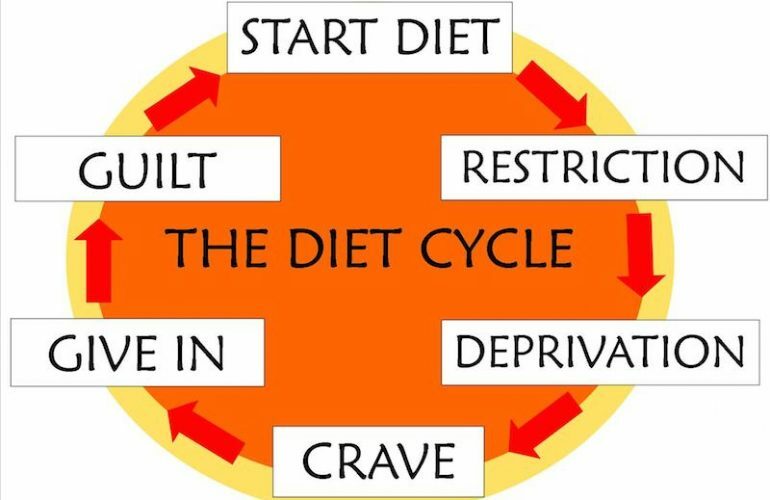 that someone gives you a system to follow….because to clarify the word ‘diet’ on it’s own actually means – Joe Bloggs’s dietary pattern e.g. Mediterranean Diet – best not to confuse the too]. OK: the reason why diets are so easy to break is because….the ‘diet system’ is based on a principle that you should cut back on food – and restrict food – and principle is essentially FLAWED. To cut a long story short – we are programmed by the MARKETING of Diets to believe the system is healthy – now….the average person who struggles with their weight isn’t aware of what to do to achieve healthy body fat without dieting – so they are effectively brainwashed to believe the ‘diet’ system is the magic solution. When it’s not – it’s actually the CAUSE of rise in high body fat over years that they go from one diet to the next. When the ‘dieter’ fails they turn on themselves – and go further down a spiral of self blame, hatred and self judgement. Subconsciously deep down, they feel like they are flawed or broken or have a body that is different to those who can achieve healthy body fat. It’s not them at all that is the problem…it is the dieting principle of OVER restriction. The dieting system is flawed because of this simple point – too much food restriction (I’ll go into this in another blog). It’s impossible to maintain this for the long term. It’s such a stress to your body. (1) – stop dieting, stop food restricting, stop counting calories, stop weighing yourself and judging yourself. (2) – learn what to do – get on a journey to learn the behaviours and habits that result in healthy body fat levels and empowerment of you. (3) – change your perception – see that you can do something about this! Please share in the comments below – do you feel confident that you can manage food to get healthy body fat levels? How many diets have you tried?